What are the indicators that you do not need a church consulting firm right now? We hear all sorts of talk about the newest tool a pastor of our church can use. Sometimes you’ll read a blog post about the three, five, or seven best of whatever to fix a certain area of your church (Yes, I know. I’m guilty). But how often do you find resources that tell you when you should NOT work with an outside consultant? My guess is not that often. Let me explain my motivation for writing this. We have learned to be more careful with which churches we will work with in order to best steward our time and best serve the church. In the past, churches have contracted with us to work with them and we find out later it was not the best time for them to hire an outside church consulting firm. Sometimes we encourage a pastor or other church leader to delay bringing in a consultant because other things need to be fixed before we come in. My guess is that every church consulting firm has seen this happen at least a few times. If they take on anyone willing to pay them money, you may want to ask yourself what that says about the company, the team, or their leadership. So before you speak with us or any other church vision consulting firm or even one that has connections inside of your church, make sure that none of these indicators that you do not need a church consulting firm apply to you or your church (or at least make sure that very few exist). Sometimes your church leaders or even just the pastor wants an outside group to lead in ways the pastor isn’t willing. An outside group that simply supports all the pastor or other leaders say without challenging their thinking is not what you want. You will end up getting more of the same and waste large amounts of money and time. Churches, like any other group, organization, or business, are profoundly affected by their leadership. Pastors often see issues in their church that need to change but I’ve never seen a pastor who doesn’t need to grow. Before a church should work with an outside church consulting firm, they should ensure that its leaders are willing to hold the pastor accountable to make tangible changes to lead and serve differently. The pastor should also lead this change by expressing and preferably demonstrating that growth needs to occur in everyone. Sometimes churches want to start a new capital campaign for a new building or other initiative. These can be exciting times. But it isn’t usually very wise to start a new capital campaign if you are already strapped with a heavy amount of debt. You may find an exception to this but in general I think we need to be careful leveraging debt to deal with debt. One notable exception is launching a capital campaign to address your current debt in order to free your church to give more to local or global missions. Rather than paying huge amounts of money in interest annually to a bank, you can free your church from the burden of debt so that it can focus more on the future than the debts of the past. In one sense I hated writing this one. But I’d be dishonest if I said it wasn’t a major issue. In the short-term it is almost always easier to talk about vision clarity and multiplying disciples than it is to actually do it. Do you really want to hire someone to come have discussions that don’t lead to real results? The problem with results is that they require action, usually a degree of conflict or at least what some call crucial conversations, and hard decisions that will likely upset someone. Decide as a team to engage in these crucial conversations so that when you bring someone in from the outside, things will be much more healthy and primed for change. Conflict occurs in churches. In all reality, it occurs in all relationships and organizations. But the problem isn’t that conflict exists but more how it is dealt with usually. In your experience, does your church deal with conflict honestly and gracefully? 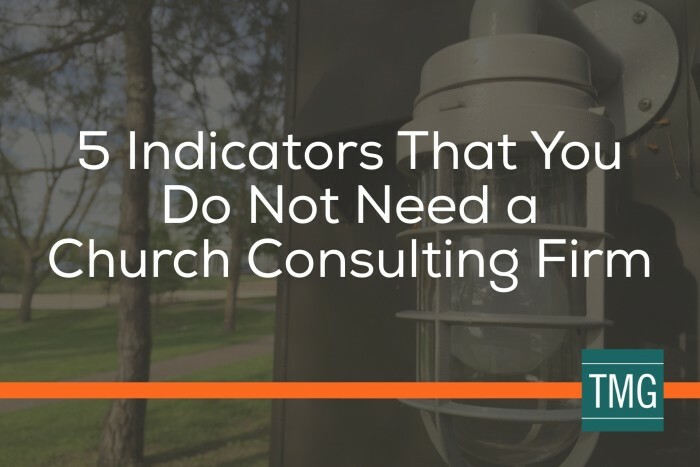 As you prepare for the next year, assess your church, and look at your own leadership, do you see any of these indicators that you do not need a church consulting firm in your church? If so, take a second to pray about what you should do. Taking initiative now to prepare for change will only increase the likelihood that your church’s readiness for change is where it needs to be when the time comes.